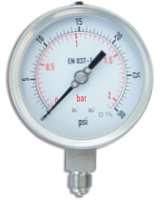 These gauges are built to resist the most stringent operating conditions created by the environment and the medium under pressure. 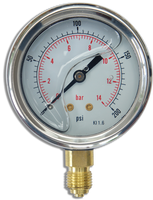 Construction is all stainless steel and may be further enhanced by the use of diaphragm seals, electric contacts and transmitters. 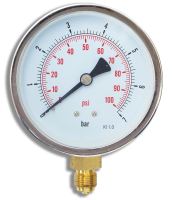 These gauges are built to resist the most stringent operating conditions created by the environment and the medium under pressure. Construction is stainless steel case with non-ferrous wetted parts, and may be further enhanced by the use of diaphragm seals, electric contacts.